This is one of the most popular 3 burner infrared grills that the Char Broil company built. In this review we will see if it can stand up to its rating and what real users have to say about this infrared grill. 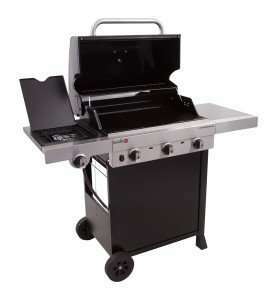 This Char Broil TRU infrared 450 grill comes in 2 version. The Char Broil Performance Tru infrared 450 3 burner cabinet grill. This what is also called Char Broil ir 450 comes with the 4 caste wheels and the 450 cart grill that comes with the 2 wheels and might be a little more stable in that way. Both grills have the same features so we just review them and at the end you can make the choice between the two versions of this 3 burner grill that comes with a main grill area a warming rack and nice side burner. Although this is called a mid size grill, I think it it big enough for a family. We have to dig a little deeper in the subject of grill surface and how you have to decide if this is big enough or maybe to big for you. If you apply the rule that you need about 72 square inches per person this would mean that you can cook for a little over 6 people. This rule is however when you cook a full meal with vegetables and sauces etc on the grill. For someone who never uses the grill for more then a burger, hotdog or steak and thus only cooks his or her meat on it this surface means enough room for about 23 burgers if you load if full. I personally always recommend to keep at least 25% of the grill surface empty, so you can move things around. This might give you an idea about the size of this grill and how much you can cook on it. The side burner is not really part of the grill surface but is a very handy and nice feature to keep things warm or cook on it. The 10.000 BTU is pretty high and thus hot for a side burner. 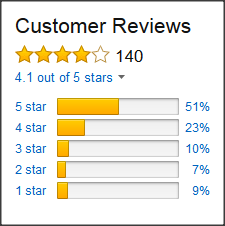 If you have read any of my other reviews you will know that I am a big fan of the porcelain coated grill grates. They are easy to clean and are rust resistant, not rust free. They will still rust if you do not take care of them, but not as fast as any of the other materials. Both the grates, the main grate and the warming rack, are porcelain coated and that is something you do not see to much. Most of the time the warming rack is made out of a cheaper material. The burner of a gas grill is a very important part of the grill of course. The Char Broil comes with what is called a top ported burner and I had to dig deep to figure out what I think it is. The holes in the burner are at the top and not at the side like many other burners do. In my opinion this is because of the infrared technique that prevents drippings to fall on the burners. I will contact Char Broil to see if this is right and update it here. Let us begin with the shipping and unpacking and assembling of this grill. I see only a few minor complaints about the grill being a little damaged when it arived. The original packing is overall well received and no complaints about that. The assembly is fairly easy and not time consuming. Most people mention it takes up to an hour to do. There are complaints about the description being not to helpful and someone even called it a joke. Just pictures and no text to help out at all. The opinions about the quality of the used materials are divided. Some mention it to be cheap and flimsy and other people are calling it a great sturdy quality. After reading more I can only come to the conclusion that the more experienced grillers are a little more critical about the grill quality and what I can call first time buyers are more satisfied with it. Like any other product it comes with pros and cons and the grill grates are no exception to this. The cooking on them get great reviews and mention things like, No flare ups, No hot or cold spots. Get really hot, and more. When it comes to cleaning the meanings are not so excited anymore. One of the thing is an infrared grill grate are the small holes and this is what prevent flare ups and gives us all the nice features. When it comes to cleaning however, and I speak out of experience, the infrared grill grates are a pain in the you know where. Burning it on high will help to burn and pulverize most of it, but you still have to do a lot of manual cleaning on these grill grates. The small holes have to be opened sometimes one by one. This is a well known con of the infrared system. The 4.3 star rating we gave it is after reading many reviews and comparing them to see if we could find some problems that came back all the time. 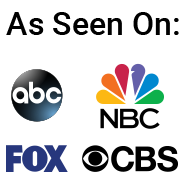 About 75 percent of the ratings we found on several site are in the 4 and 5 stars. 3 stars were given in about 20% of the cases. The lower ratings were sometimes in my opinion minor complaints and not really a reason to give it 2 stars. Receiving a damage grill is no fun, but has nothing to do with the quality of the grill and should in my opinion not be a reason to give a one star rating. Just send it back, although I totally understand how disappointed you are. The cons are also very easy to find. What we always do is try to find common complaints about the grills we review and in this case the only thing we could find was the damaged arrival of the grill in some cases. Overall we can say that this grill is a nice mid range grill for a decent price and is worth the money you spend on it. Like any other grill we advise on a good quality grill cover. In the store we found this grill it was or sale as a 3 burner cabinet grill and as a 3 burner cart grill. This means that you can buy it the way it is easy to use for you. If you do not plan on moving it to much the cart version with the two large wheels would be recommended. If you like to move your grill over the patio or deck the cabinet grill with the 4 wheel might be a better choice. The infrared grill system works great and takes away all the aggravation when you cook and have to take care of flare ups and hot and cold spots. The 3 burners can help you create a cool spot on you grill so you can grill hot first and then move it to a cooler spot. The cleaning of the infrared grill grates is not easy and cost a little elbow grease and time. The fact there is no drip tray was mentioned as a con, but with no flare ups and hardly any grease going down under the burners I think this is not a big thing. If you do not buy the grill cover and grill combination we recommend to buy a good grill cover to shield your grill from the elements. It will sure make it last longer. 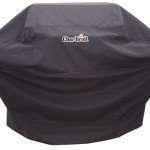 We recommend the special Char Broil 3-4 burner performance grill cover for this grill. It is always easy to copy and past a standard tip, but we prefer the ones from people who use the product. It takes a little time to get used to the infrared grill system. The temperature is a little higher than a normal gas grill and the food cooks faster. Tip: Start with some burgers to get the hang of using your new infrared grill. It is better to ruin a burger than a 12 dollar steak. Read all our Char Broil tru infrared reviews by going to the menu at the top of this page.